The Mexican government is moving ahead with an ambitious new plan to surround the Lacandona Forest in Chiapas, Mexico, with oil palm plantations; while disguising the forest around the plantations with various eco-tourism sites. In preparing for the two-faced project, the government—still in line with the old ambitious plan—and with the help of various corporations, is clearing the Rainforest of its Indigenous People. The most recent evictions took place on Jan. 21 and 22 at the indigenous Tselales settlements of Laguna El Suspiro and Laguna San Pedro—“the last one a base community of the Zapatista rebel movement,” explains the WW4Report. The Fray Bartolomé de Las Casas Human Rights Center, Fray Pedro Lorenzo de la Nada Human Rights Center, Serapaz and others have also denounced the evictions and demanded that the communities be compensated for their heavy loss. They also warn that seven more communities are facing imminent eviction, including Nuevo San Gregorio, Nuevo Salvador Allende, Nuevo San Pedro, 6 de Octubre, Poblado Laguna El Suspiro, Ojo de Agua el Progreso and San Jacinto Lacanjá. Throughout the current and previous administrations in Mexico, nearly fourty communities have been evicted from the Lacandona forest. Multinational corporations are covetting strategic natural resources in the Lacandon Forest in the Mexican state of Chiapas. At the same time, the state government is pursuing ambitious plans to surround the Lacondan Forest with oil palm plantations, while disguising the forest around the plantations as ‘eco’- tourism areas. The corporations are preparing for those projects, by attacking and evicting indigenous communities. On 21st and 22nd of January this year, the indigenous Tselales communities of Laguna El Suspiro and Laguna San Pedro Guanil, both inside the Biosphere Reserve of Montes Azuls in the Lacandon Forest, were evicted. Montes Azules is home to one third of Mexico’s biodiveristy. According information by the newspaper La Jornada (in Spanish), the eviction took place on 19th January this year, when the head of the Federal Agency for Environmental Protection (PROFEPA) visited Chiapas. A few hours later, hundreds of policemen and soldiers evicted around twenty indigenous families (120 indiviuals) from their homes in the region. Government sources state that the operation was carried out in coordination with the federal police, members of the Mexican Army and of PROFEPA, ironically in the presence of ‘representatives of the state’s human rights’. No details have been given as to who those human rights representatives were. Our understanding is that the Mexican government used fake ‘human rights representatives’ in order to commit human rights violations against indigenous peoples. During the two operations, the police forces were heavily armed and used several helicopters. Witout any official documentation or court order, and by means of violence and threats against elderly people, women and children, they forced the indigenous people to leave their houses without being allowed to take any of their personal belongings, and took them to the city of Palenque. There, twelve villagers from Laguna San Pedro Guanil were taken to the government ministry and were interrogated without a solicitor or interpreter. Before being released, the villagers were made to sign a document without understanding the content. 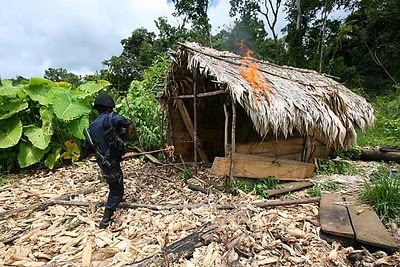 They later reported that intimidation was used to get them to respond to the question “Where are your fields where you grow drugs?”, a question which indicates how the government intended to justify the evictions retrospectively. The villagers report that various of their belongins as well as their houses, clothes and work tools have been destroyed, their fruit trees, maize and beans have been uprooted and their communal shop has been ransacked. Local witnesses report that after the evictions, the houses and belongings of the villagers were burnt. So far, no opportunity for resettlement has been offered. Violent evictions and forced relocations had previously been carried out in approximately forty communities, by both the current and previous administrations. These are part of a policy to creating a ‘new order’ and clear the Lacandon Forest of people, particularly in the Montes Azules region. The Mexican state is thus promoting social dislocation and ongoing legal uncertainties as well as the appropriation of communal property in favour of private ownership. This results in the irreversible loss of the concept of land as a source of communal wealth. The evictions can be understood through a strategic global project of ‘territorial evictions and control’, which is disguised as a ‘conservationist spirit for the benefit of humanity’ (or, as a government spokesperson has said “…for the good of Chiapas’, for the good of Mexico’s and for the good of the world’s environment”). In reality, it serves the interests of multinational corporations and private investors in strategic natural resources in this and other indigenous and peasant territories in Mexico and Central America: Biodiversity, forest cover, clean drinking water, natural scenery and minerals, are all coveted as resources by biotech and agribusiness companies (Monsanto, Pioneer, Norvartis, Bimbo), pharmaceutical companies (Pharmacia, Bayer, Pfizer, Sanofi Adventis), car and oil firms (Ford, General Motors, Shell, the International Automobile Association (FIA), drinks manufacturers (Coca Cola, Nestle, Pepsi), hotel chains and false ‘eco-tourism’ firms (Mexican Association for Adventure and Eco-Tourism, AMTAVE), as well as mining companies (CEMEX, owned by PEMEX. Several of them have had a direct or indirect presence in the Lacandon Forest for years. At the same time, the governor of Chiapas, Juan Sabinas, has imposed an ambitious programme of economic reform which icludes the expansion of oil palm plantations and aimes to turn Chiapas into one of the main centres of production for agrofuels, with all the impacts that go along with it.